The B.C. native on the creative process behind her historical fiction novel My Name Is A Knife. Alix Hawley is a B.C.-based writer and author. Hawley was the winner of the 2017 CBC Short Story Prize for Witching, a story about a woman struggling to connect with her boyfriend after his return from combat. She was also the winner of the 2015 Amazon.ca First Novel Award and the Ethel Wilson Fiction Prize for her debut novel, All True Not a Lie in It, a book that fictionalized the life of Pennsylvania Quaker Daniel Boone and garnered her a spot on the Scotiabank Giller Prize longlist in 2015. Hawley returns to Boone's story in My Name is a Knife. After being captured by the Shawnee, Boone has become an adopted son of the chief and is happily married to a Shawnee woman — despite having a second wife and children in a settler town. But Boone begins to feel guilty when the Shawnee begin planning an attack on the settlers' village. He escapes to warn them, only to discover his wife has left and Boone is not exactly welcome in his old community. 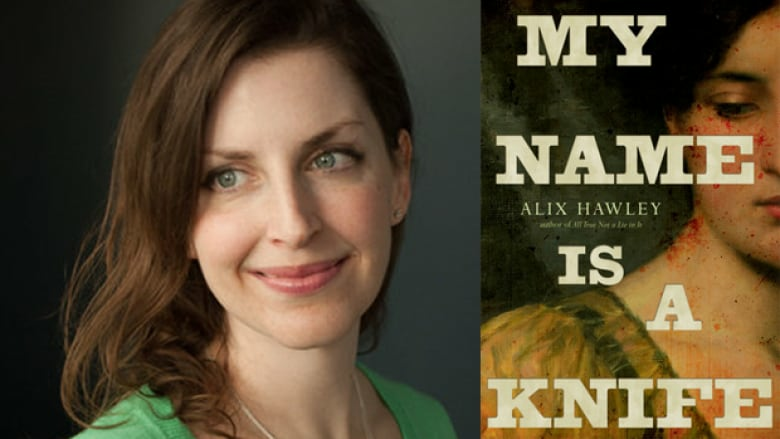 In her own words, Hawley talks about how she wrote My Name Is A Knife. "I'd probably make the worst frontier person there ever was. I'm vegetarian, I've never hunted in my life and I'd probably last about three minutes on the frontier. But what drew me to the story is the idea of what it would have been like to be a celebrity at that time, like Daniel Boone was. What would it have been like to be world famous at that time? So that's what set me off down this strange path. When I finished the first book All True Not a Lie in It, I realized I wasn't completely done with Dan and his wife Rebecca. With this book, My Name Is A Knife, Rebecca has more of a voice in the story. I wanted to get into her head, and highlight the difference in her and Dan's point of view, which took me a long time to get right." "It still feels weird writing in the first person. I naively assumed that writing in Rebecca's voice would be a bit easier, being a woman and a mother myself. But it took a really long time — some writers that I workshop my writing with noted that in early drafts Rebecca's voice sounded like Dan in a dress! I had to come to terms with the fact that she's a lot more clipped and more silent than Dan is. Trying to come up with a voice that is more taciturn and clipped and yet self-revealing was the trick with her." "I don't read books on writing craft but I do read almost anything else I can get my hands on. I'm always interested in how books come together in terms of style and structure. Just by reading broadly, I'm now being able to figure out writerly tricks a little bit more than I used to. That helps me see the possibilities that are out there." "The trick with historical fiction is to stick to the chronology and the events as best as you can. From there you can dig into the holes in the story. Man Booker Prize-winning author Hilary Mantel once said so much of historical fiction is about what is unwritten. "I think that's what I gave myself license to do — to dig into those parts where we don't know exactly what happened. We know there was a battle, we know Dan ran away from the Shawnee at one point, but we don't know why or what was going on in his mind. We also don't know a whole lot about Rebecca at all except that she left the fort assuming that Dan was dead. That's pretty rich soil for a writer to make stuff." Alix Hawley's comments have been edited and condensed.